When FRC team 1477 was first established, we worked out of a U-Haul storage unit. We then moved into an unused science classroom at College Park High School, but it didn’t take us long to outgrow that space either. 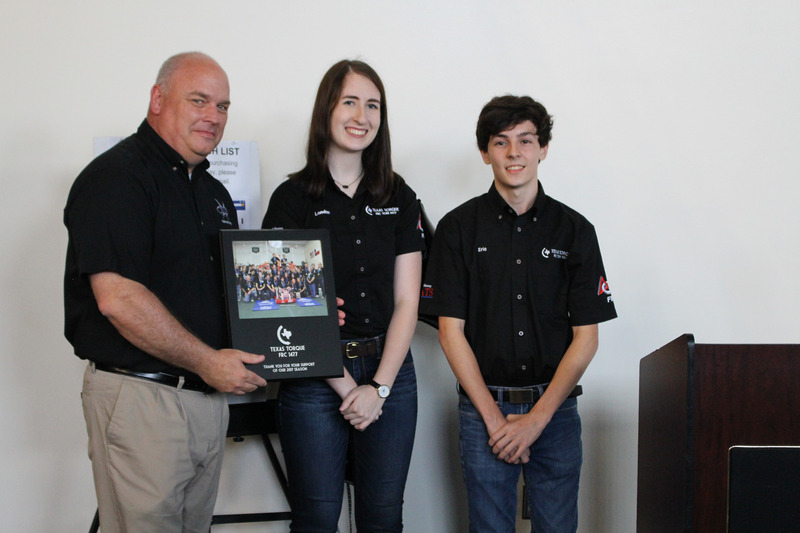 A few years ago, we presented our proposal for a district robotics center to our school district’s superintendent. Our superintendent approved, and in 2015 our new robotics lab was added to the district bond referendum. Students then went to polling locations to advocate for the bond, talking to voters and distributing flyers designed by the team. A few months later, construction began. Mr. Rip, our lead mentor, welcomes visitors to the new lab. Our new lab is a two-story extension of College Park’s gym wing. We drew up plans and sent them to the construction company, along with requests for equipment. Construction finished around the end of the school year, and we’re beyond excited to settle in and get to work! 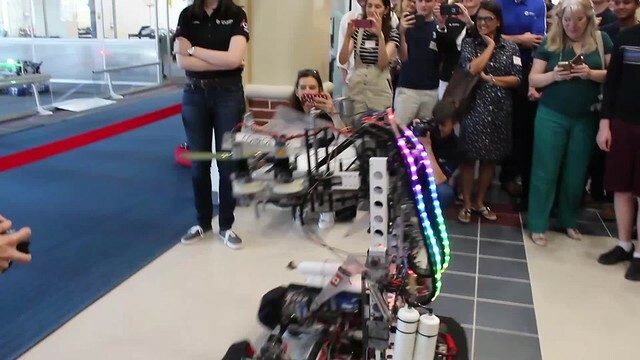 Sonic, our 2013 robot, cut the ribbon to open the new facility. 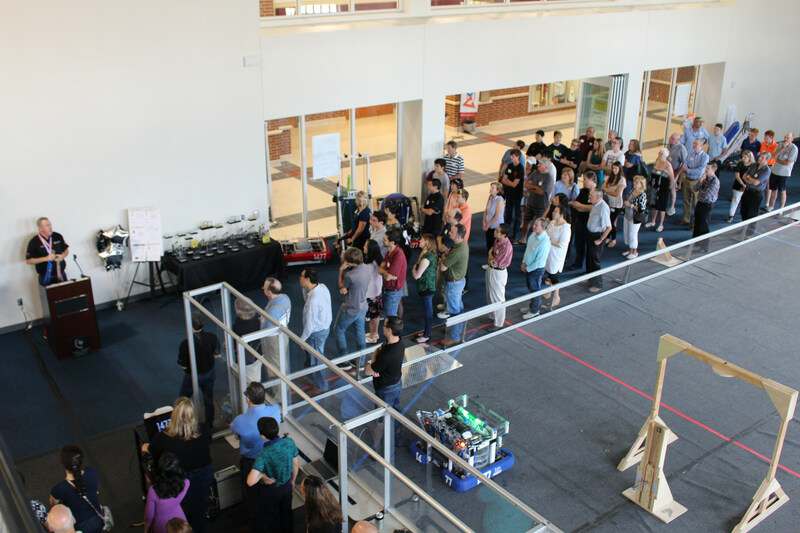 During the event, attendees were invited to try their hand at driving our robots. We also welcomed several members of the CISD staff who made this possible, including Dr. Stockton, our superintendent; Dr. Caffery, headmaster of the Academy of Science and Technology; and Dr. Murrell, principal of College Park High School. Team president Eric R. and former VP London D. thank Dr. Murrell for his support. We can’t wait to see where the new facility takes us! Our team is working to establish it not only as a new lab for us, but also as a center for robotics within our district. Come visit us during the Remix! 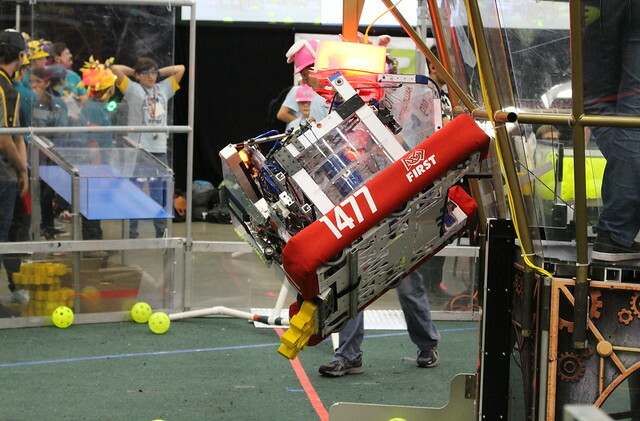 Competition season may have ended, but there was no shortage of robotics action last weekend at the 2017 Texas UIL State Championship. 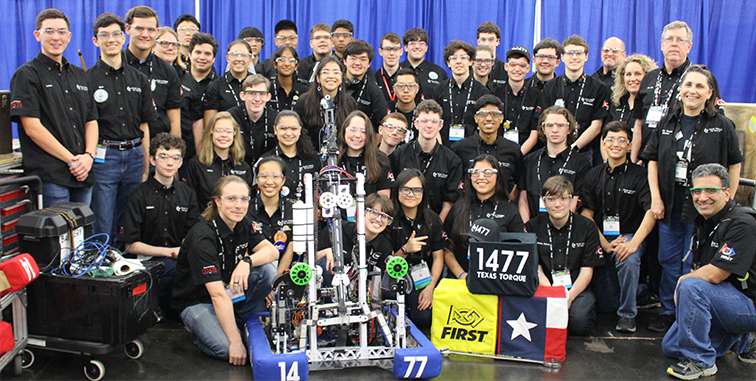 Teams from all across the Lone Star State came to the Austin Convention Center for two exciting days of off-season competition. The event is in its second year and also includes an FTC division. We would like to congratulate teams 118, 3310 and 6547 for winning the second Texas UIL State Championship. We had a great time playing against y’all, and we look forward to seeing you at future off-season events! As the last event of our official 2017 season, Texas Torque attended the inaugural Houston World Championship (our 7th consecutive World Championship) after qualifying at Hub City (Finalist Alliance Captain) and Lone Star Central Regional (Regional Winners, Chairman’s Award). Located in the George R. Brown Convention Center and Minute Maid Park, the championship brought more than 400 teams to Houston. Texas Torque played on the Roebling field, competing against 66 other teams for a spot on Einstein. Through qualification matches, Texas Torque played well, ending with a 7-5-0 win-loss record. We selected team 1414 IHOT, team 5803 Apex Robotics, and team 6508 Hastings to join us in the eighth-seeded alliance. During playoffs, our alliance was eliminated in the quarterfinals against the alliance that would go on to win Roebling and Einstein. Congratulations to Roebling winners 973, 1011, 2928, and 5499 for their stunning performance and World Championship victory! 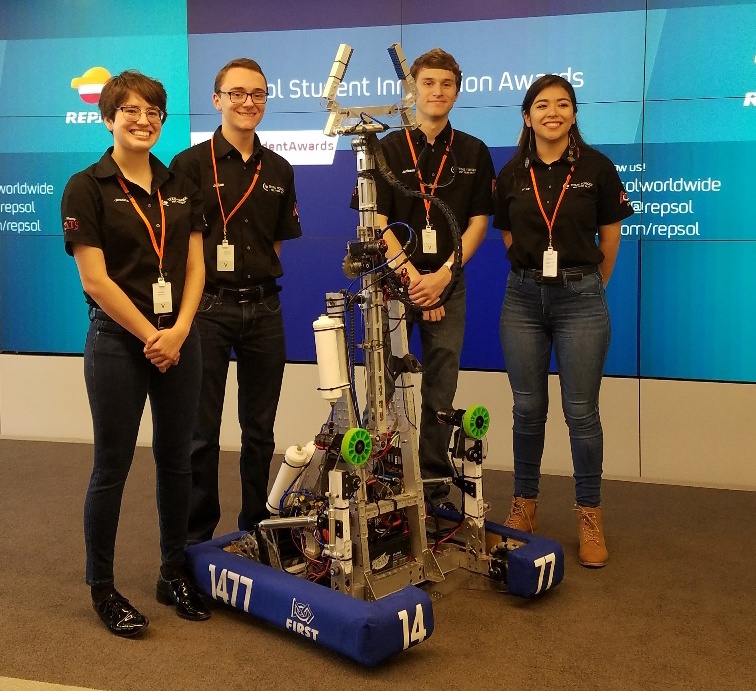 We would also like to congratulate our friends the Robonauts for reappearing on Einstein as the Newton division champions, as well as team 3132 the Thunder Down Under for their induction into the Hall of Fame. We’re thankful to have enjoyed a successful and action-packed 2017 season, but the action hasn’t ended yet — we’ll be taking flight this May at the Texas UIL State Championships! Earlier this week, First Updates Now (FUN) asked fans to vote on which teams they thought deserved to be the top 25 robots out of all the Week 1 competitors. After voting closed, FUN announced their results on their First Updates Now livestream on April 4th. As Texas Torque members eagerly watched the livestream, we were very excited to find out that out of the over 800 teams that competed in Week 5, Texas Torque was voted the #19 spot! To see the full list, you can watch the episode here. We’re looking forward to attending Houston Champs in 2 weeks and keeping Texas Torque in the top 25! Texas Torque was honored to host the Week 5 Lone Star North Regional at College Park High School this past weekend. We had 33 teams from Florida to Mexico to Turkey compete to become the winning alliance. Texas Torque spent the practice day making mechanical changes to our robot, adding on a new floor gear intake. During the qualification matches, Texas Torque played very well, ending with a 9-2 win/loss record and a 1.90 ranking score, placing us 2nd. 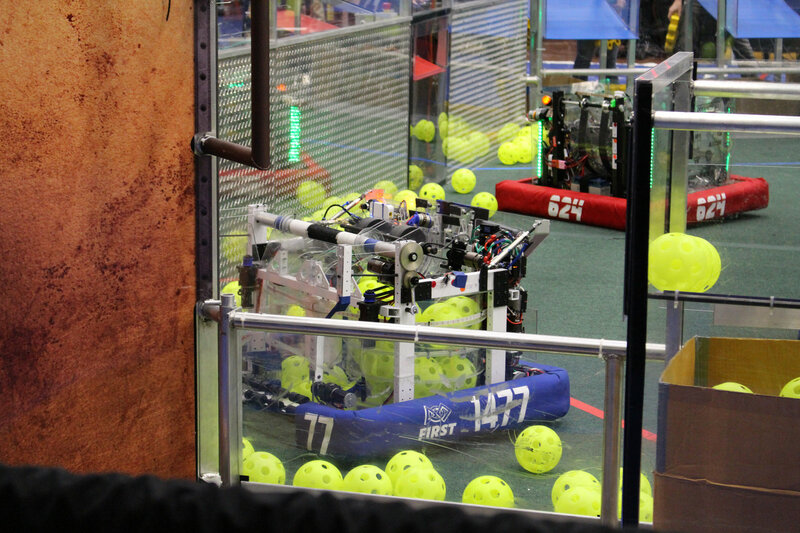 During alliance selections, we allied with 2992 S.S. Prometheus, 4295 Hudson Robotics, and later, 6363 Ricebird Robotics. We had a great run, but lost in Semifinals to a great 3rd seeded alliance (who went on to win the regional!). We would like to congratulate 3284 Camdenton 4H LASER, 5842 Royal Robotics, and 6547 Flaming Metal Robotics on their regional win! Serious props to our mentee team Flaming Metal Robotics – they won their first and only regional of their rookie year! During the awards ceremony, Texas Torque took home the Quality Award, and our own Ithza Lopez was chosen as a Dean’s List Finalist! Also, a HUGE congratulations to our friends 2881 Lady Cans for winning their first Chairman’s Award!!! We would also like to give a huge thanks to the student, parent and mentor volunteers that helped our first ever regional run so smoothly! We’re looking forward to hosting more in our new lab these coming years. Earlier this week, First Updates Now (FUN) asked fans to vote on which teams they thought deserved to be the top 25 robots out of all the Week 1 competitors. After voting closed, FUN announced their results on their First Updates Now livestream on March 21st. As Texas Torque members eagerly watched the livestream, we were very excited to find out that out of the over 800 teams that competed in Week 3, Texas Torque was voted the #6 spot! 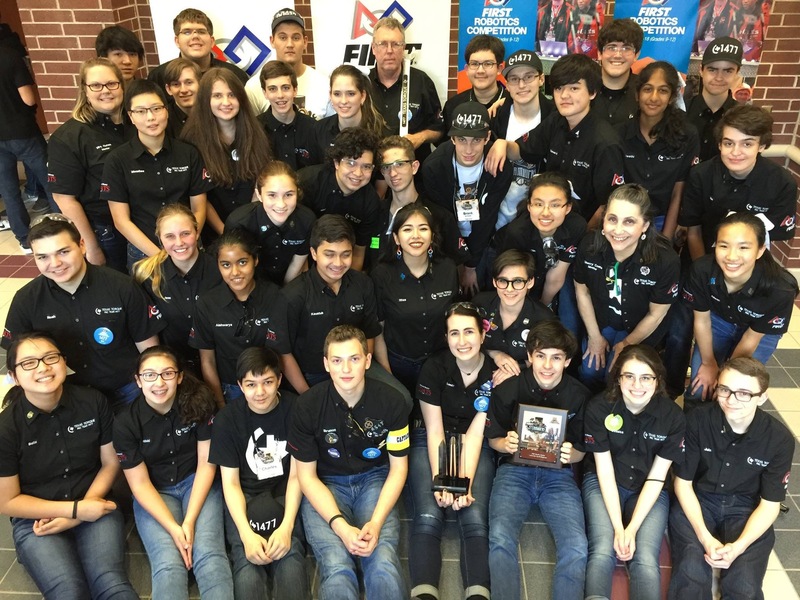 We would also like to congratulate our alliance teammate from Lone Star Central The Robonauts for ranking #2, and all other teams who ranked in the top 25! To see the full list, you can watch the episode here. We’re looking forward to hosting Lone Star North during Week 5 and keeping Texas Torque in the top 25!